Another massive three points in the bag for the Rose in their pursuit of the Super League title. However, they are taking nothing for granted and Broughty showed just how tough this league is. They took a first-half lead through Jamie Winter and defended like demons to keep Rose out. An inspired 60 seconds saw Ross Archibald head home the equaliser in 65 minutes and then Keiron McGachey hit home a fine winner. Broughty: Ross, Lawson, Cameron, Syme, Myles, Lunan, McLellan, Winter, Buchan, McConnachie, Clark. Subs: Sinclair, Mair, Smart, Lannen, Whyte. Bonnyrigg: Andrews, Archibald, Donaldson, Stewart, Moyes, Young, Turner, Kidd, McGachey, Nelson, McIntosh. Subs: Horne, Tobin, Gray, Drummond, McLaren. Broxburn won with ease but did have their work cut out when Fauldhouse got one back to make it 2-1. The home side cruised into the lead when Scott Richards got the ball 30 yards out and ran forward before scoring high into the net. Kieron Anderson made it 2-0 halfway through the first half with a close-in effort from a Locke knock down. The visitors got back in it when Rarity made a clumsy challenge just inside the box bringing down two Fauldhouse attackers. Michael Browne made no mistake from the spot. Anderson got his second with just under 20 minutes left after Nimmo sent him clear. The game was won in style when a Anderson free-kick just outside the box was slipped to Young who cut the ball back to Richards whose first shot was saved but he buried the rebound. Broxburn Athletic: Maley, Longridge, Young, M Miller, Scott, Anderson, Richards, Nimmo, Locke (Purves 50), Dalrymple (Magee 86). Subs: Cole, Robertson, King. Fauldhouse United: Murphy, Watson, Lawson, Ross, Fallon, Campbell (Wilkins 46), Robertson (Bonnes 76), Browne, Love, Donnelly, Stewart. Subs: Miller, Cowan, Peace. Penicuik were two goals down in the first five minutes when a mistake by Liddell allowed Cargill in and he gave Bejaoui no chance. Then an excellent move saw Ritchie slam home a Gates cut back. It took only 14 minutes of the second half to put the game to bed when Cargill outpaced the defence to make it 3-0. Cargill completed his hat-trick when a powerful header off a corner kick deflected off him into the net. Kelty: Allison, Carstairs, Gates, O’Neill, Courts, Husband, Ritchie, Greig, Dalziel, Cargill, Currie. Subs: Morrison, McCabe, Smith, Campbell, Marley. Penicuik: Bejaoui, Devlin, McDermott, Young, Liddell, Lister, Jancyzk, Barr, McCallum, Somerville, Lough. Subs: Fraser, Blaikie, Patterson, Thomson, Gay. Linlithgow emerged with a thumping win courtesy of doubles from Tommy Coyne and Colin Strickland. The visitors struck first when Coyne finished off a fine move after 24 minutes. Tayport were level within five minutes when Tulleth rounded Adams to score but his joy was short lived as Strickland fired the visitors ahead within a minute. The striker added a third just before half time. A second-half header from Coyne and a late scrambled effort from Kelly sealed the rout. Tayport: Sorley, Ogg, Robertson, Ovenstone, Kay, Elvin (Finlay 79), Rollo, Tulleth (Connelly 79), Adam, Sutherland (Cavanagh 73), Reid. Subs: Anderson, Cargill. Linlithgow: Adams, Thom, Baptie, McKenzie, Leiper, Ruari MacLennan (Weir 68), Batchelor, Shirra, Strickland (McGregor 79), Coyne, Kelbie (Kelly 73). Subs: Jones, King. 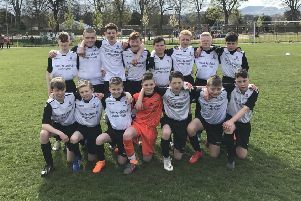 Haddington racked up a sixth consecutive league victory to maintain their slim hopes of Super League football next season, inflicting on West End a first league defeat since December 19. The Hi Hi’s Scott Wright came closest to a first-half goal when his shot came back off the post on 20 minutes. The game’s only goal came five minutes into the second half. Arran Ponton’s corner from the left fell for Haddington’s top scorer Paul Devlin around 15 yards out and although he didn’t get a particularly clean strike the ball bounced past the defenders and into the net. Haddington: Amos, Sproule, Forbes, Hume, Cunnison, Ponton, Berry, Fairnie, Martin, Sinclair, Wright. Subs: Hill, Devlin, de Almeida, Noon, Bleakley (sg). Forfar West End: Burns, Stephen, McDonald, L Godfrey, McKenzie, Rae, Fullerton, Ramsay, Hart, Reynolds, Petrie. Subs: Bell, Bews, Moncrieff, Reid. ST ANDREWS caused a major shock. The visitors dominated the first half yet missed several opportunities to go ahead due to some wasteful finishing. Bo’ness went ahead on the hour when Chris Donnelly drilled home a drive. The home side got level when Paddy Deane had a penalty saved before scoring the rebound. The tie went to a shoot-out with Barry Sibanda scoring the winning spot kick. Bo’ness: S Christie, Hamilton (Snowdon 53), Devine, Campbell, Gibb, Gemmell, Simpson (McAteer 65) Philp, Donnelly, Sloan, Wright. Subs: C Christie, Morrison & McDonald. St Andrews United: Clarkson, McMullan, Dobie (Mackie 79), Murdoch (Sibanda 71), Wedderburn, Patrick, Deane, Buchan (Cunningham 65), Brand, Rolland, Whitehead. Sub: Wilson.